At least 19 people lost their lives in encounters with police in the United States last week. The victims, all men, ranged in age from 18 to 53. Seventeen were shot to death, one tased, and one both tased and beaten and strangled. In only two of the cases were the victims shot while engaged in violent attacks on others. All the others were shot while fleeing or allegedly resisting police, or while experiencing mental health or emotional crises. 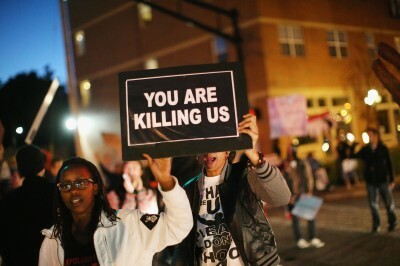 In several instances the police killings sparked protests. In El Cajon, California, a suburb of San Diego, there were protests over the death September 27 of Alfred Olango, an immigrant from Uganda who was tased and shot to death while unarmed. Olango was having an emotional breakdown after learning of the death of a friend. In Pasadena, California, a suburb of Los Angeles, more than 100 people gathered to protest the killing of Reginald Thomas, father of eight children, after police were called to address a domestic dispute early Friday. The 36-year-old black man, who was reportedly bipolar, was said to be waving a knife and a fire extinguisher when police arrived. Despite the claims by Democratic Party politicians and middle-class groups like Black Lives Matter that police violence is exclusively a matter of race, with white cops killing African-Americans, the 19 victims last week included at least eight white men, a Hispanic man and an Asian man. The race of the police killers was usually not reported, but the killings took place in many cities with racially diverse police forces, including Newark, New Jersey; Houston, Texas; and Los Angeles and San Diego, California. The geographic distribution of the killings included inner cities, suburbs and rural areas, and all regions of the country, from the Northeast to the Pacific Coast. By states, the killings fell as follows: Arizona, Arkansas, California (3), Georgia, Idaho, Illinois, Michigan (2), Minnesota, New Jersey (2), Ohio, Pennsylvania, South Carolina, Texas (2), and West Virginia. The death toll on a single day, Friday, September 30, gives a glimpse of the savage character of social relations in the US and the unrestrained brutality of the police, who serve as the first line of defense for capitalist property and the authority of the capitalist state. There were no less than seven victims. * Clayton Eugene Baker, a 24-year-old white man, shot to death by a Trinity County sheriff’s deputy in Groveton, Texas, a small town north of Houston, after the policeman arrived in response to a reported domestic dispute. * Douglas Marrickus Rainey, a 32-year-old black man, shot to death by a SWAT team in rural Gowensville, South Carolina, hours after a reported armed robbery at a Dollar General which led to a general lockdown of the region. * Najier Salaam and George Richards-Meyers, both 18 years old, shot to death by six Newark, New Jersey police, who claimed to be confronting a three-man gang responsible for a series of carjackings. None of the officers was injured despite claims of a wild shootout. * Jacquarius M. Robinson, a 20-year-old black man, killed by a police SWAT team in Columbus, Ohio, 10 hours after police responded to the scene of a shooting death on the city’s east side. Robinson attempted to flee and police shot him dead. It was not known whether there was any evidence connecting him to the earlier killing. Public attention has focused on the killings in southern California because these provoked angry protests, albeit on a limited scale and without further clashes with the police. Tensions rose again over the weekend after an 18-year-old black youth, Carnell Snell Jr., was shot to death by police about 1 p.m. Saturday in south Los Angeles, after police stopped a car on suspicion that it was stolen. Two people fled from the car and police shot and killed one of them, later identified as Snell. Police claimed to have found a handgun at the scene, but there was no indication that the youth had the gun in his possession or had fired it. Police frequently place “throw-down” guns at the site of such shootings to provide retroactive justification. There were protests from family members and other local residents, including one young woman who told the Los Angeles Times, “A police officer should not be the judge, the jury and the executioner.” Snell’s mother, Monique Morgan, said she had been told her son was shot five times in the back. Witnesses told the local CBS television station KCAL that Snell had his hands up and was telling police not to shoot him when they opened fire. According to the grim tally kept by the web site killedbypolice.net, the week’s death toll, including the police shooting Sunday morning of an as yet unidentified man in Markham, Illinois, a suburb of Chicago, brought the year’s total to 868 people. A separate tally, maintained by the Washington Post, found that whites comprised 46 percent of the victims of police killings this year, blacks 24 percent, and Hispanics 16 percent, with other races and undetermined accounting for the remaining 14 percent. Blacks are killed by police at a much higher rate than their proportion in the population, an indication that racism plays a significant role, but the number of white victims demonstrates that class, not race, is the more fundamental issue. Nearly all the victims of police killings are from the working class, and usually its poorest sections. Police killings do not take place in Beverly Hills, Grosse Pointe or the Upper East Side of Manhattan, but in lower income areas, whether urban, suburban or rural. That does not stop Democratic Party politicians from seeking to cover up the class character of police violence with rhetoric about “systemic racism.” Hillary Clinton did so during her debate with Republican Donald Trump last Monday and again during a visit Sunday morning to an African Methodist Episcopal church in Charlotte, North Carolina, where 36-year-old Keith Scott was gunned down by police September 20. Scott; the policeman who killed him, Brentley Vinson; and the Charlotte police chief in charge of whitewashing his death, Kerr Putney; are all African-American. That fact alone demonstrates that the struggle against police violence requires uniting workers of all races in the building of a political movement directed against the capitalist class and the police and politicians who serve it.